What the papers say: November 12 | What Car? What car-related news is making the national press today? Find out here with our daily review. 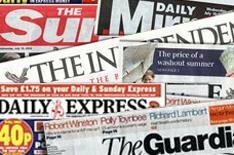 We check all the national press - from the FT to the Daily Star- to see what's hitting the headlines. The Sun reports on the plight of the British motor industry. The paper talks of a 'double whammy' for the UK's car makers, as not only are sales falling at home, but there has also been a massive slump in orders from overseas especially worrying as 77% of British-made cars are exported. The Times reports on fears that one of America's 'big three' car manufacturers could go bankrupt before Christmas. The share price of General Motors has fallen below its 1946 level, leading to President-elect Obama to press George Bush for an immediate injection of cash to the ailing industry. Bush has indicated he is 'open to proposals' that could help prop up Chrysler, Ford and GM. Want to escape high fuel prices, beat the congested streets and avoid possible increases in VED road tax? The Times has the answer eat your way to obesity! The paper's comment piece tells how upgrading your waistline could entitle you to subsidised public transport and gym vouchers. The subsidies are all part of a new Government-funded scheme to make us all healthy. The German manufacturer revealed that its Volkswagen Bank, a unit of its financial services division, intends to ask the European Central Bank for liquidity next month using 2.8 billion (2.27 billion) in securities backed by German car loans as collateral.